I don’t like websites that are too busy. I like clean and uncluttered websites. I like to find what I need quickly and not waste my time searching through massive amounts of text, tons of links and multiple pages to reach my destination. I know I am not alone. Your homepage does not need to show every little thing you have to offer. Let your homepage be a starting point with simple, easy-to-navigate menus. The easiest way to design a clean and uncluttered website is to use drop-down menus. I find drop-down menus are a great way to sort and organize links and information without having it all visible at once. Drop-downs can start with maybe five or six main navigation sources, then break out into many more, as in the picture below. 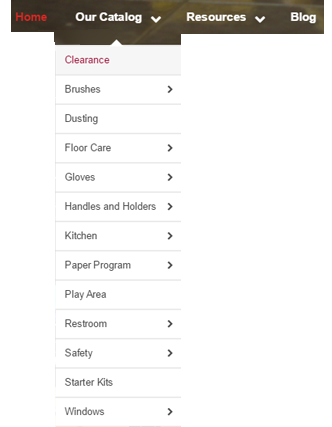 That way, you are only seeing the links to all of the various catalog entries when you want to navigate them. All of the links with arrows on the right mean there are additional view options available. You want people to be able to find your information easily. The harder it is for someone to navigate, the more likely the person will be to leave your site and go somewhere else. When the internet first became popular about 20 years ago, most websites were filled with text and links. The days of those types of websites are long gone. You want a clean and uncluttered website with images, video and easy navigation. Keep it simple and your website will do the work for you.